In a free, public lecture Dan Rhatigan looks at the Letraset brand of rub-down type and other graphic supplies, showing how they put the tools of professional design into everyday hands. It will also look at how people had to improvise with Letraset, and make the most of the materials at hand. Registration is required. 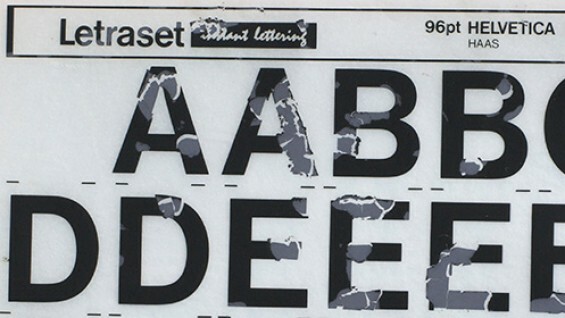 Letraset and other brands of rub-down type literally put typography in the hands of the people. Rub-down type made it possible for students, professionals, and everyone else to design with real typefaces, without needing professional typesetting services. A cheap and easy way to experiment with typography and other graphic elements, Letraset put a lot of care into making type easy to use well, but it also resulted in a lot of ways to use type badly, but with interesting results. With some care and attention, however, it was a great way to develop an eye for typography. Dan Rhatigan worked as a designer and typographer for 15 years in Boston and New York before moving to England in 2006 for graduate school at the University of Reading. After receiving his MA in Typeface Design, he spent seven years working with Monotype as researcher, type designer, and eventually Type Director. He now lives in New York City again, where he works as an independent type designer and consultant.